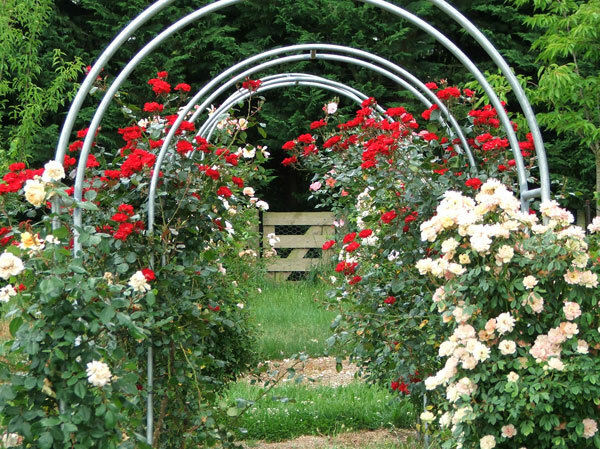 More Archways - More Roses! There have been some rose planting failures. Lady Hillingdon, with her beautiful fat pale apricot flowers and reddish foliage, has never grown properly. After several unspectacular summers she's going to be dug out - well, actually two of her, because the idea was to have one each side. Then two Uetersens were sold to me as climbing roses. That's a joke! They are now growing happily, with masses of blobby pink blooms that barely reach the top of my gardening legs. Again these roses have had a few years to demonstrate their tendencies... But I'm going to keep these healthy fatties on, and perhaps add a climber next door. 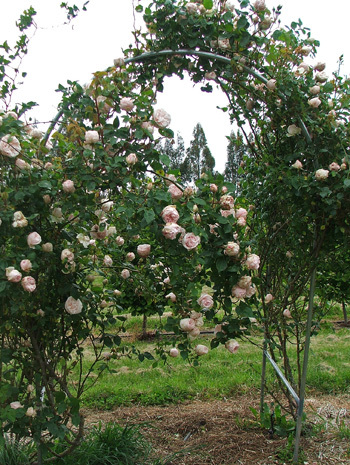 Two Easleas Golden Ramblers were recommended by the rose nursery as suitable for modest rose archways. They were definitely not modest enough! I've replaced them with an assortment of second hand climbers from a gardening friend. The thirteenth archway (oops - that sounds unlucky) is now on a lean. This is partly caused by the weight of the rose (Souvenir de la Malmaison) and partly by the fierce southerly winds. 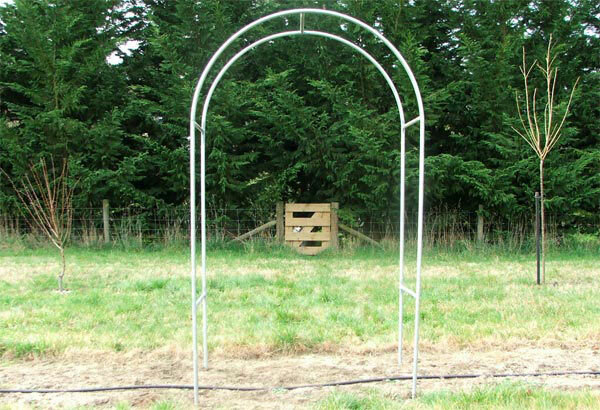 This archway is one of the last garden outposts, and there's no shelter. Non-Gardening Partner has promised to push it back up before it totally falls down. I'll hold him to that!